As part of our exclusive feature interview section in The Bugg Report, we have been fortunate to pose some searching questions to Manny Stul in relation to just how he managed to deliver such an enormous success story. Australia is a relatively small country and often credited with punching well above its size and weight in the global community. There has been an emerging story in the toy & licensing business, which relates directly to an Australian toy company and its entrepreneurial owner, which clearly demonstrates this sentiment. Moose Toys and Manny Stul have been busily building their business over the past 15 years, where they have navigated many highs and lows and recently they have been rewarded with the global success of their home grown Shopkins concept. Shopkins has grown to become a global phenomenon over the past 18 months and has driven the sales line for Moose beyond a half a billion dollars! Not bad for an Australian toy company who has taken its product portfolio global but remained at home. Shopkins has outshone brands such as Barbie and My Little Pony over recent times and it is testament to the perseverance of Manny and his team to stay the journey in the challenging global marketplace. Manny, many people in the industry who don’t know you may assume that Shopkins has been an overnight success. Nothing could be further from the truth I am sure! Can you tell us a little bit about some of the challenges which have confronted you along the way during the Shopkins journey? It really is an amazing brand. Four years ago Shopkins launched and completely reinvigorated the collectable category globally, creating mass hysteria as children collected and traded their prized characters. We are just about to go into Season 9 and the brand has transformed from a small collectable toy into a fully-fledged global franchise brand. To date, we have sold over one billion units of Shopkins and have over 300 licensing partners! The biggest hurdle we have had to overcome as a business was pre-Shopkins in 2007 when we had an issue with one of our craft products Bindeez. A factory substituted a chemical without our knowledge and it resulted in a worldwide recall. We worked closely with our distributors to reach agreements that meant we were able to stay operational. It was a very difficult time, especially given that we had to come to 34 individual agreements but in the end we developed even better relationships with our partners due to the way we handled the situation. Those relationships still hold strong today. I understand that you are very passionate about innovation. In an Industry that is often prone to duplication, what is your philosophy in relation to developing product concepts and establishing directions for your company? I am. Innovation has always been in my blood. When I was beginning my career and building my giftware business, innovation was a survival mechanism to ensure my business had a niche and remained relevant. All the lessons I learned through that period I made sure I brought with me to Moose. The most important lesson that I learned was that innovation starts with your people. Your people and your team build your culture. And the right people and fit will help breed innovation. We do things differently at Moose. I like to say we have innovation in our DNA. It was important for us to create an environment where our team can use their imagination and we have done this through our creative hub. It gives them freedom to be bold and adventurous with their concept whether they are in product design, marketing or HR. It is also important to stay true to your roots. Being based in Melbourne we have the benefit of being thousands of kilometres away from where most other toy companies are located. This allows us to innovate and create or own intellectual property (IP) without feeling the pressure to follow trends. We ensure that we get the basics right and we do this in parallel to identifying new trends and development opportunities. We know we need to set trends, not follow them, and be agile when needed. We empower our team to back themselves and to set big goals. All of these things are key to fostering an environment of innovation at Moose! The sort of success that Moose has delivered over recent times is often as a result of a team effort. Jacqui and Paul have been with you along the way, how have they contributed to your vision for the business over the years? We are a team and all of us have been invaluable to the success and great culture at Moose. Jacqui has extraordinary talent and intuition with product, and Paul is a force of nature with his drive, charisma and his eye for product. He really drove our success in to the USA market. I also understand that you now have over 350 team members as part of the Moose family. How do you value their contribution to what you have achieved? They are essential! We have worked hard to create a team which values creativity and innovation and this has been one of the key drivers to the success of our business. We take care of our team and work hard to cultivate a relationship of honesty and trust with them. We all work hard and give every task 100%. But it is important that we can support our team with the opportunity to look after themselves and refocus. We do this via our health and well-being program, free to all staff including: a fully equipped gym, personal training, yoga, ski trips, training programs and much more. We now have teams across Melbourne, Los Angeles, Hong Kong, China, London, Paris and Vietnam, and we now distribute to over 100 countries, which is an amazing achievement. Manny, there has been a lot spoken about your new corporate offices in suburban Melbourne. What did you set out to achieve in the planning stages? We have people from all corners of the globe who come to work with us and we wanted to create an amazing space for them at our HQ Melbourne. 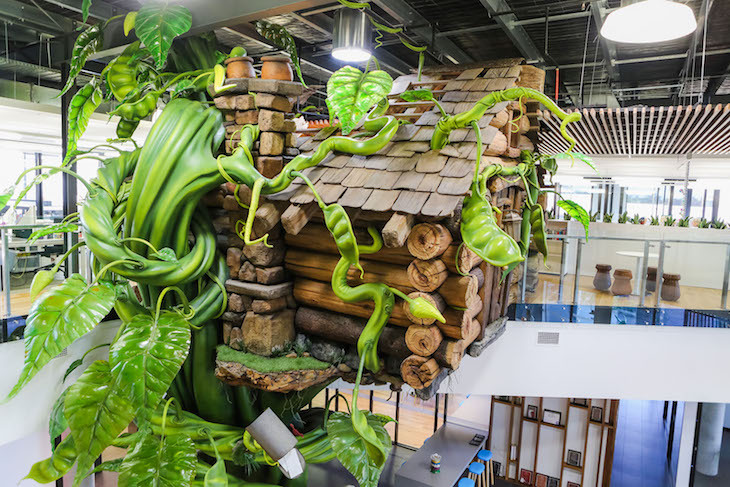 Creativity, innovation and fun were top of mind when planning our office space and we are so proud of it! 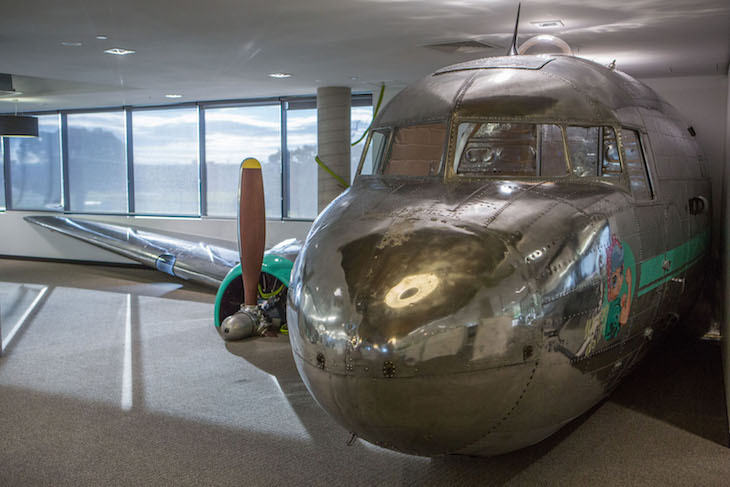 We have a giant tree house in reception, we have half a plane (yes a real plane – an old DC3) upstairs that the team uses as a skype room and the other half is in the downstairs garden and used as a lunch room. We feel incredibly lucky that we are based out of Melbourne, Australia. It is one of the key things that makes us different and sets us aside from most other toy companies. What is your over-riding philosophy in terms of making sure that Moose remains at the top of the tree for many years to come? It is important for us to continue to embrace the changes in technology and to continue to disrupt and not allow others to gain an edge. Innovation in everything we do is essential to our continued success. From what I read you are also planning to get into the movie business with the release of a Shopkins movie. Can you tell us a little about this? It always made sense for us to transition Shopkins from a toy brand into entertainment. Storytelling is at the heart of how we develop many of our brands. When Shopkins was first released we established the characters through webisode shorts on YouTube which gained huge traction and made our fans hungry for more content. Shopkins has now established itself as a fully fledged entertainment franchise! Last October we released our first direct to video movie – Shopkins Chef Club – which ended 2016 as number one new DTV release for families. This September we are launching the follow up – Shopkins World Vacation which we anticipate to be an even stronger property. There is the potential for a movie (well at least an option signed) so we could hint to watch this space for a theatrical movie in the near future? Thoughts? There are many younger executives who are now coming through the Toy Industry. What would your advice be to these budding Entrepreneurs who may consider developing their own success story? Find a niche in the market and do things differently. Find something you love and that you are passionate about. Be ambitious. Think globally. Surround yourself with fantastic people and have the right people in the right seats. Remain disciplined in thought and action and always treat people with honesty and integrity. And finally continue to innovate, it is absolutely imperative to success. You were recently recognized and inducted into the Australian Toy Industry Hall of Fame. What does this accolade mean to you? It is a great honor. The Australian Toy Industry is an incredibly exciting space at the moment and it is very humbling to be recognized by my peers. Manny, how do you see the next three years ahead playing out for Moose? We are very excited about the future at Moose! We are always looking to evolve and the immediate future is no different. We are focused on making sure our passion to innovate and be different gains momentum and we keep creating great brands and products which includes exploring new product categories. Increasing our charitable work is also a big focus for us now and into the future. As your product portfolio grows and evolves, do you see any standouts in your range which the market should look out for? At Moose we are known for our disruption in the collectable category. We have just released two new amazing toys that show the evolution of collectable play. Pikmi Pops are miniature plush characters that come in their very own pop vessel – perfect for unboxing play. And Cutie Cars are quirky, die cast vehicles that each have their own theme. They are defying the notion that die cast cars are just for boys and sales out of the gate have been phenomenal. Finally Oonies. It has been years since a truly unique craft product has been released and disrupted the craft category but we have created this quirky fun and creative product unlike anything seen before in the craft and activity space. Oonies enables kids to create their own mini balloon like art. It is clear that Manny and Moose have stuck to their plan along the way. From our research he sights honesty and integrity as some of his secret weapons. These two corner stones have worked for him and helped the company through good and bad times. He encourages all of us to be more innovative and daring when making decisions in business and believes other Australian companies can use this innovation to move onto the world stage. We have been very privileged to gain some insight into the Manny Stul and Moose story. Our congratulations on his recent awards and we wish he and Moose every success in the future.